Yamaha caused a sensation at the end of 1984 with the launch of its FZ 750 sports bike, powered by a 20-valve four-cylinder engine. The idea might not have been new - in 1902 Napier built a racing automobile with five valves per cylinder (a central exhaust valve surrounded by four automatic intake valves)- but Yamaha was the first to use five valves per cylinder on a seriesproduction bike. The remarkable flexibility and power of the FZ 750 proved the worth of this complex layout. The advantage of the five-valve head is that it gave optimal gas flow in conjunction with small, light valves possessing minimal inertia at extremely high revolutions. Moreover, each little valve only needed a lightweight spring, putting less strain on the engine. The FZ 750 only needed a top-end overhaul every 26,000 miles. 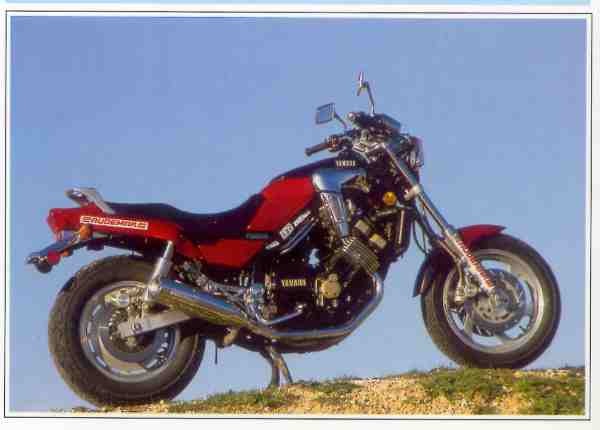 The success of custom bikes led Yamaha to launch the 750 Fazer in 1986. This hybrid machine, with a rather sporty engine and styling heavily influenced by American choppers and dragsters, proved to be a superb compromise. The absence of a fairing was not conducive to sustained high speeds, but it could call on huge reserves of power when the occasion arose. It was ideal for city traffic, where its appearance and ample brightwork stood out splendidly. The FZX Fazer merged Americanized styling with racetrack technology in an inspired compromise between show and go.